Ready yourselves, sweet nostalgia angels. Mac Cosmetics is releasing another themed collection, and it’s perhaps the most ’90s thing in all of the ’90s revival products we’ve seen so far. Good Luck Trolls, which will be available to the public this August, has been created in conjunction with the upcoming Trolls movie, starring Anna Kendrick and Justin Timberlake. Yes, those trolls — the naked, big-haired dolls with jewels for belly buttons. You know, the ones who have somehow become a go-to group Halloween costume for college-age women everywhere. 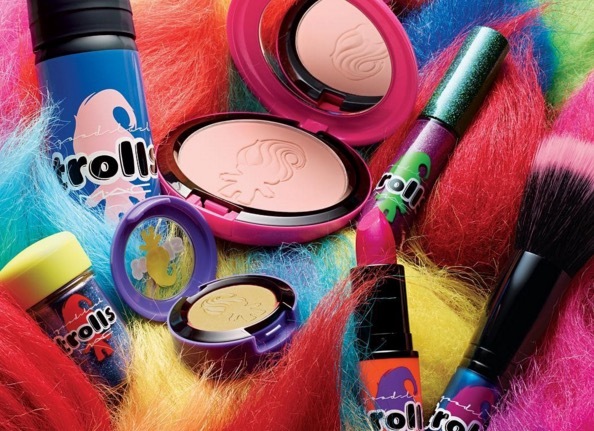 In anticipation of Dreamworks’ Trolls movie (which is coming to theaters this November), Mac Cosmetics has created a Trolls-inspired makeup collection. There’s a lot of glitter and holographic packaging involved. We need all of it in our lives. This collection is giving us major flashbacks to applying frosted lipgloss in a middle school locker mirror — in a good way. Though the line isn’t available until August, BuzzFeed’s Style department got their hands on some seriously insane samples and tested them on more than 16 different models with a variety of skin tones. You guys, there’s a sheer turquoise lipgloss called Twerkoise. There’s a super-shimmery gold eye shadow called Suns Out Buns Out. We can’t. We cannot. Perhaps the best part of this highly-pigmented, glitter-filled Trolls collection is that it appears to be universally flattering. Troll makeup for ALL! Troll makeup for THE WORLD!